S6 Augers : SARL Maxima, Specialists in the sale and reparation of machines and accessories for the construction industry. Importer and distributor of both hydraulic and pneumatic equipment. 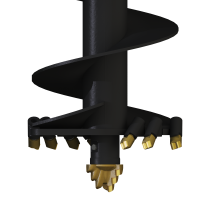 The S6 Range of Augers has been specifically designed for use on Excavators up to 20T and large Backhoes. S6 Range Augers are available with a number of wearpart combinations, catering from soft grounds all the way to mixed rocky grounds and even permafrost. Heavy duty tubes, constant spiral cut as well Auger Torques unique Shock Lock™ Tooth Locking System (Rock Augers excluded), which will guarantee that you will never lose your auger teeth when reversing your auger, have given Auger Torque Augers their industry leading reputation. The standard hub for the S6 range is 75mm Square, however we are able to supply most hub options on the market. All Augers are shown with Shock Lock Tooth Holders. 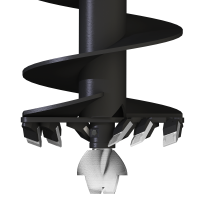 Rock Teeth requires a Rock Tooth version of the Auger. 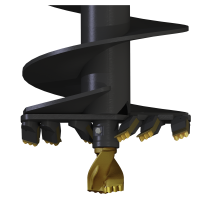 Overall Length given includes the auger fitted with wear parts. Augers of a larger diameter and length can be manufactured for use with these Earth Drills, but technical advice is required. Contact us for more details.